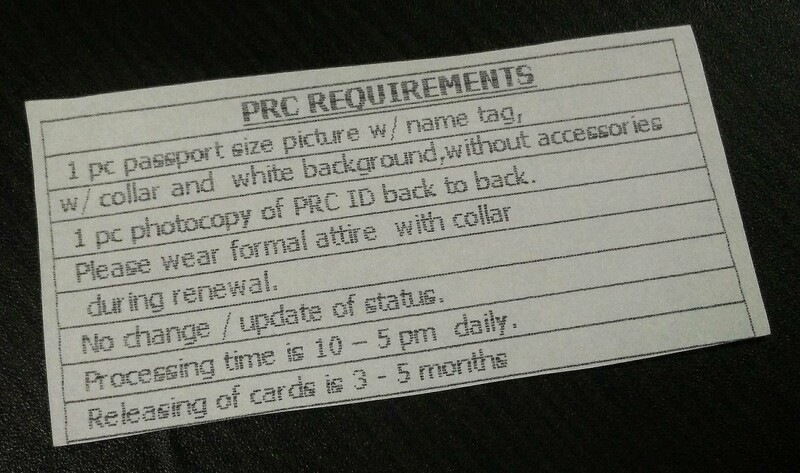 Professionals in the Philippines can now renew their license online at prc-online.com BUT the web service is only useful if you live in or near Manila. That’s because the appointment scheduling module only works if your appointment (for picking up your new PRC ID) will be at the Professional Regulation Commission’s Central Office at P. Paredes St. cor. Morayta St. Sampaloc, Manila. Otherwise, you still have to renew your PRC license the old-fashioned way. No worries though — the process for renewing a license at PRC Cebu is very quick and orderly. If there aren’t too many people, you can get your new PRC ID in less than an hour. (Yes, you can get the actual ID right away; you won’t have to come back after 3-5 months to get it.) In our case, there were around 15-20 people ahead of us but we still finished the whole process in 1.5 hours. The annual fee is ₱150/year. The license is usually renewed for 3 years from the date of renewal, so the fee will usually be ₱450. There’s also a surcharge of ₱30 for every year you go beyond the expiry date of your license. Foe example, my friend and I had our license renewed this year (2016). Our new licenses are scheduled to expire in 2019. My friend’s old license expired in 2014. Her annual fee was ₱150 x 5 years (2019 minus 2014) = ₱750. Her surcharge was ₱30 x 2 years (2016 minus 2014) = ₱60. Her total renewal fee was ₱810. My license expired last year (2015). My annual fee was ₱150 x 4 years (2019 minus 2015) = ₱600. My surcharge was ₱30 x 1 year (2016 minus 2015) = ₱30. My total renewal fee was ₱630. This is very important. What usually takes a long time at PRC is the queue for having your photo taken. You can skip this part entirely by bringing your own photo. Just go to a photo studio in the mall and tell them it’s for PRC. The photo should be colored with white background. You should be wearing a shirt with a collar. The photo should include your name: LAST NAME, FIRST NAME MI. Another thing you can do at home — so you don’t have to do it at PRC — is to photocopy both sides of your old PRC ID. You only need one copy. 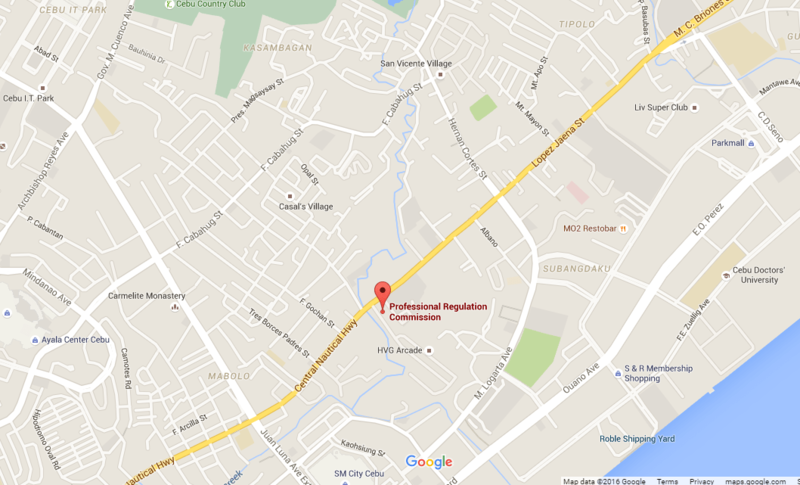 The PRC office in Cebu is at HVG Arcade, Subangdaku, Mandaue City (beside InnoData). If you don’t know where that is, just take a taxi — the driver will know where to go. First, go to the Assistance Desk (right in front of the entrance) and ask for the renewal application form. There are narrow tables at the back where you can fill up your form and they have paste that you can use to attach your photo. Next, go to the License Renewal counter and submit the form, the photocopy of your old PRC ID, and an extra copy of your passport-size photo with name tag. Sit down in one of the chairs (there are plenty) and wait for your name to be called. Then, when your name is called, go back to the License Renewal counter and review the info in the piece of paper that the PRC officer will give you. If all the details are correct, proceed to the Cashier to pay the renewal fee. There will usually be rows of chairs in front of the Cashier, which will serve as the queue. Instead of standing in line, you sit on the chairs and wait for the person at the counter to finish their transaction, then the person in front of the “queue” goes up to the counter, and you all transfer to the next chair. A friend went to the SM office more recently and she was told the processing time would be 20 working days (and no longer 3-5 months as stated in the slip above). If you’re always in SM anyway, and you don’t need your PRC license right away, this could be a good option for you. Wherever you choose to have your PRC license renewed, good luck! © Small-Town Girls, Midnight Trains. All rights reserved. Contents verified as of 14 April 2016.